soy beans for homemade almond or soy milk. 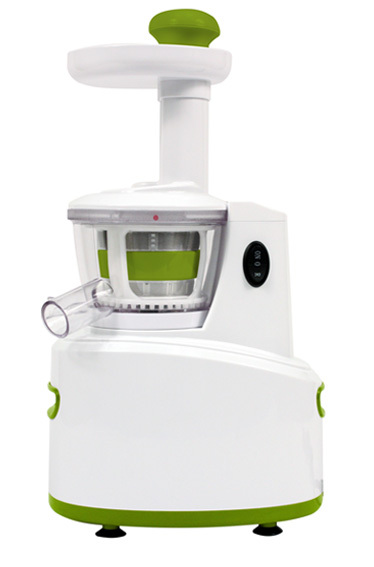 With JuiceMax Juicer you will get all the additional nutritional benefits while enjoying better taste and less waste! Since there are no blades, there is lower friction and lower oxidation and foaming, which means your juice stays fresh and great tasting for up to 72 hours! Cold press juicer with 150 watts of maximum power. Small, vertical design takes up less space on the counter top. Auto cleaning system wipes the screen clean to increase efficiency. *Security Code: What is my Security Code? By pressing this button you agree to the terms and conditions of this sale. "JuiceMax Juicer has changed my entire outlook on fruits and vegetables, it's a fun and creative way to get the vitamins and minerals your body needs. Now, it is no longer "enough" to just eat a salad w/dinner. I crave the fresh/raw nutrients that I get when I juice my vegetables. And instead of a small portion of the good stuff (kale & spinach) I can consume three times as much by drinking it. It tastes delicious and refreshing - and I'm doing something healthy and beneficial for my body. It's a win-win!" "The BEST way to Juice!! I love my JuiceMax Juicer!! I've used many others, including the bullets, fusions and fast juicers and this REALLY gives me the juice I've been looking for. I love that the juice lasts so much longer because of the slow way its extracted. The pulp that comes out is super dry, so I know I'm getting all the juice out of everything I throw in there. The clean-up is a bit more involved but for the amount of QUALITY juice you get, it's worth it because you can extract a lot more and store it longer without worrying about the enzymes breaking down. LOVE THIS THING!!" "I use the juicer 5 days a week and I love it. It's better than purchasing juices from the market, because I get to add my own ingredients." "I was looking for a juicer that would be easy to use, reliable, and that would get the most juice out of my fruits and vegetables. I was browsing through google for "juicer more juice" and JuiceMax juicer was a little pricey, but all my granola friends recommended a slow juicer. I juice every day now and using this juicer just makes it so simple. Not to mention, thecustomer service was superb! After my first use I wasn't sure how to clean the machine so I called customer service number and they were super friendly and walked me through the process. It made me even happier about my purchase. Will definitely recommend JuiceMax Juicer to all my friends and family. Great product!" We'd love to hear your genuine feedback. Please write us a review about your juicing experience with the JuiceMax Juicer. © 2013 JuiceMax — All rights reserved.